On Thursday of last week, we were making a grocery list and I opened the door to the pantry on the guy's side of the house. My very first thought was "we could put Velveeta on the list" because this was what I saw. The reason I say put Velveeta on the list is because we don't need the noodles. Yes, that's right, the "garlic chef" as we like to call him, came down for a midnight snack and used 6 packages of the cheese in the Velveeta Shells and Cheese. The shells are all still there - he says he'll make a pasta salad at some point and use them there. 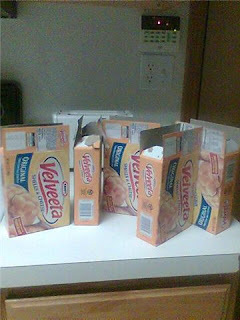 We tried to point out that it would be much less expensive to purchase cheese separately rather than waste six boxes of mac and cheese. But as you might guess, he wasn't buying into our reason. Pasta anyone? ?